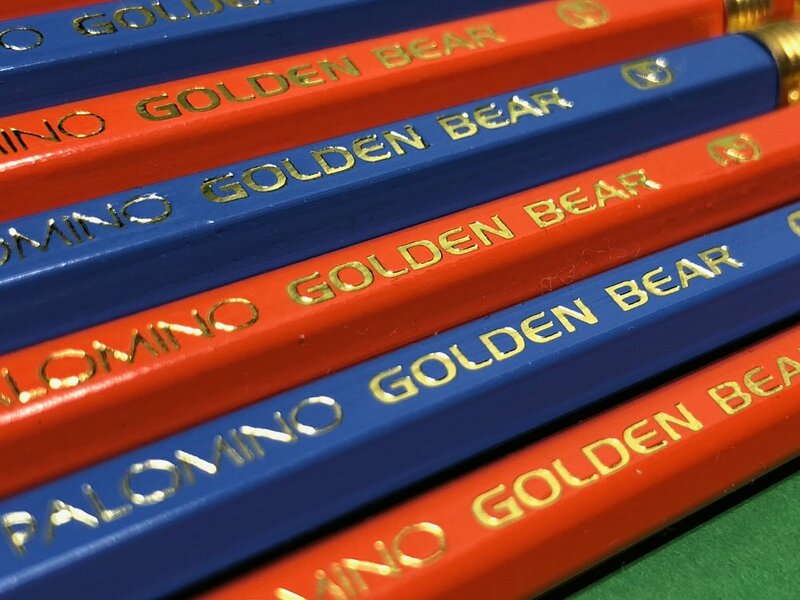 It's been almost a year and a half I've been writing this blog and I can't believe that I've yet to review the Palomino Golden Bear. This pencil is a staple in my everyday carry pencil bag and great as a "car pencil". 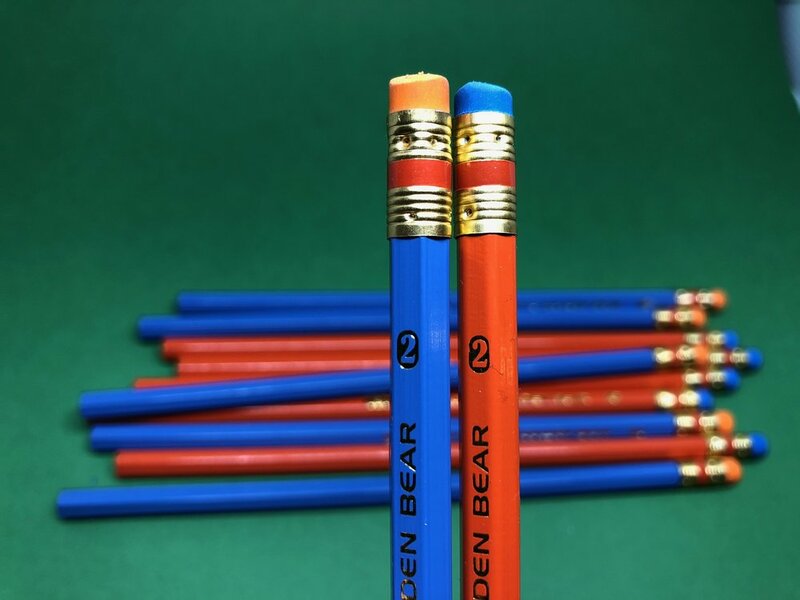 Basically, anywhere I keep a pencil, you're likely to find a Golden Bear there. It's an amazing pencil for the price. There are two color options available, orange and blue. The orange has a slight reddishness to it, and the blue is somewhat light. 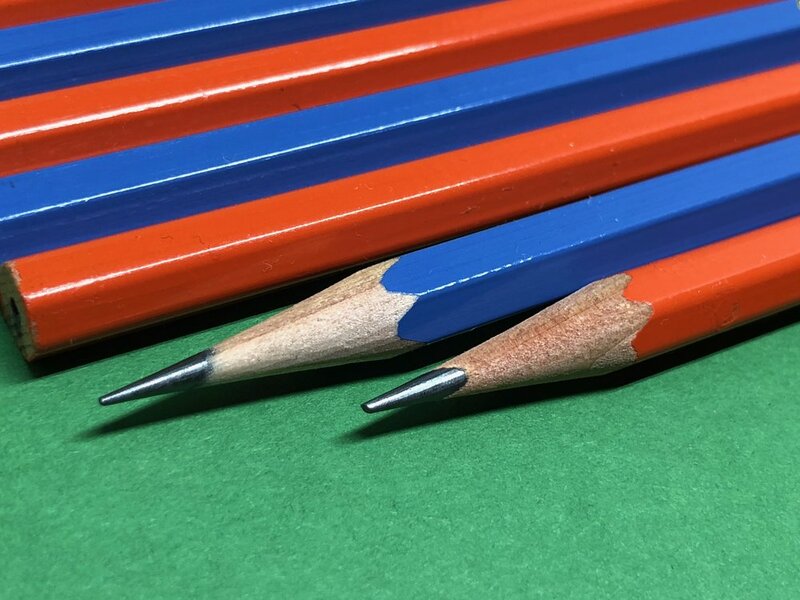 Each color has the exact opposite color eraser on it, so blue atop orange and vice-versa. 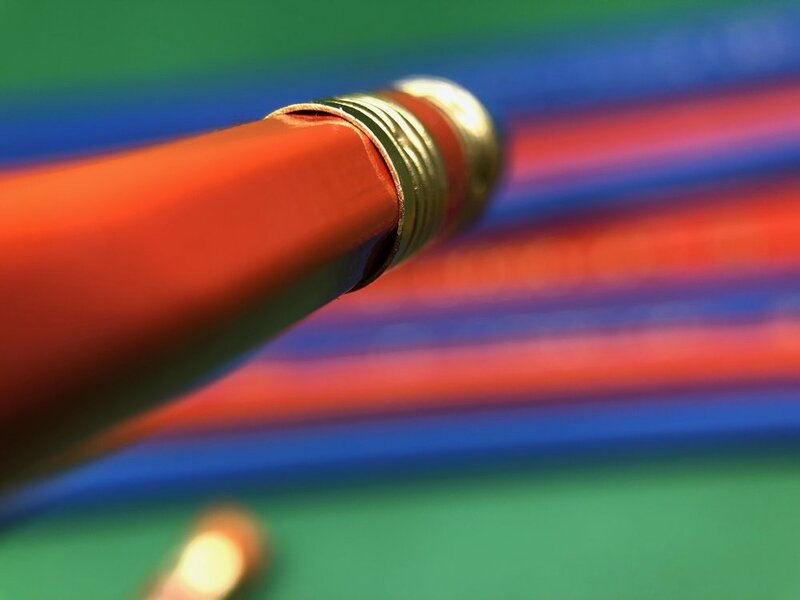 Both pencils have the same ferrule, which is brass-finished with an orange paint stripe around the middle. My preference is for the orange lacquer and blue eraser. The blue of the eraser is a bit darker than the blue lacquer color, and it works really well with the orange. 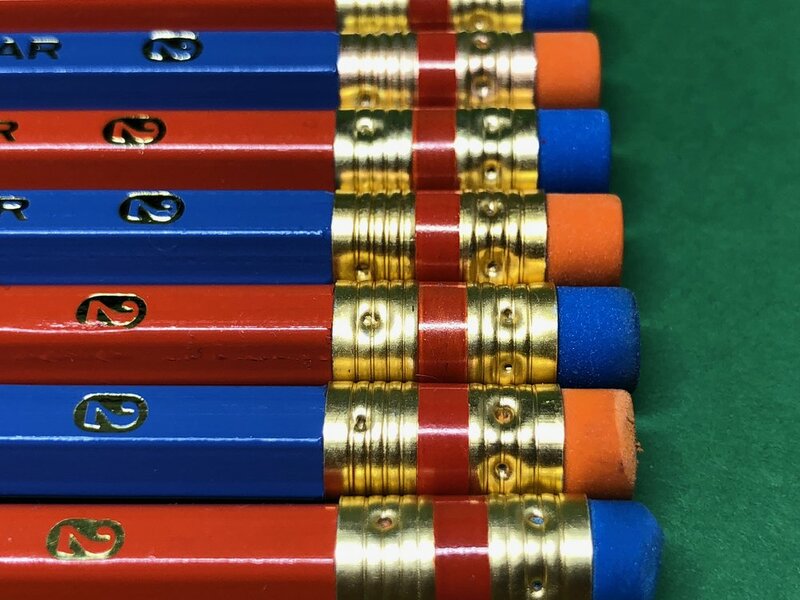 The orange eraser on the blue pencil, however, is lighter than the orange lacquer and the combo doesn't look as good, in my opinion. The wood is cedar, of course, as it comes from Palomino. It's fairly fragrant. It's also hex shaped. 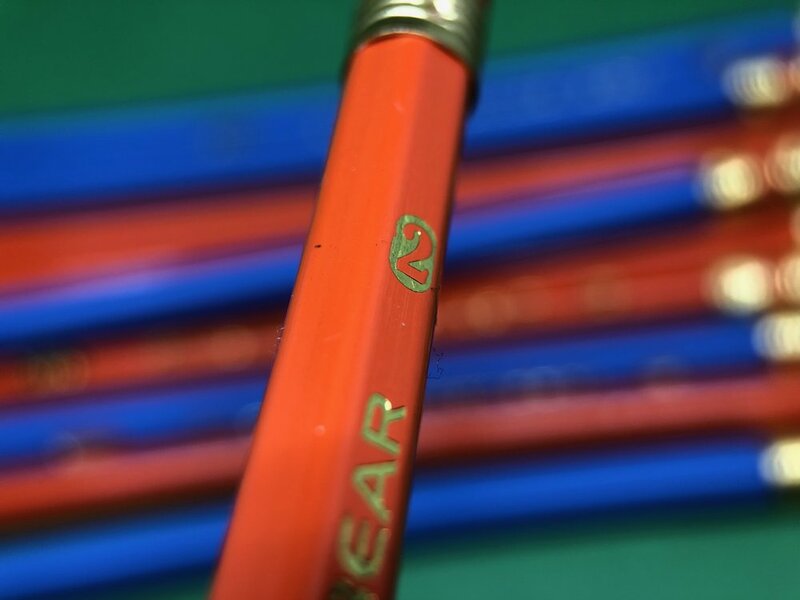 This is where it's a bit off...the blue GBs I have are full Musgrave-style sharp hex (which makes since, because Musgrave produces these pencils) but the orange ones are a softer hex. 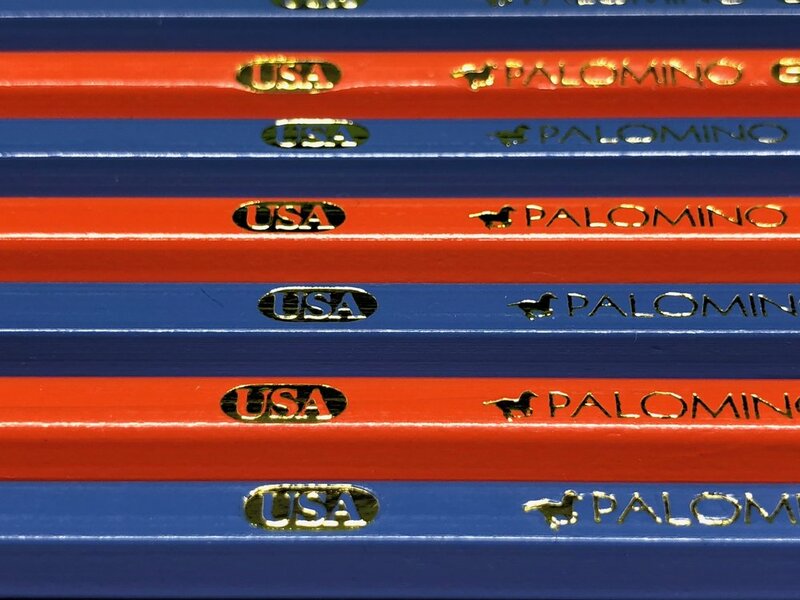 They are also a bit thinner, like a newish cedar Ticonderoga or a USA Gold. From what I understand, the thinner style allows for one more pencil per slat. You can see the difference in the pictures. You can tell when they've used the thinner style when the ferrule seems a bit big and doesn't quite fit the pencil properly. Not that it comes off, there just seems to be a gap. Now, my Golden Bears are a bit older and still have the old Palomino horse logo on them. From what I've seen in pictures and discussion online, the new Golden Bears, branded with the bear symbol instead of the horse and having dropped the Palomino name, they're back to full hex. I feel like my blue ones are a bit older even than the orange ones, so there was probably a sweet spot there in the middle when Musgrave made them with thinner barrels and a rounded hex...which is my preference. No matter, however. The cores are all great on every one I've tried. They aren't Palomino HB smooth, but for the price, they write really well. They're a bit chalky rather than waxy, but still smooth with a audibly scratchy feedback. 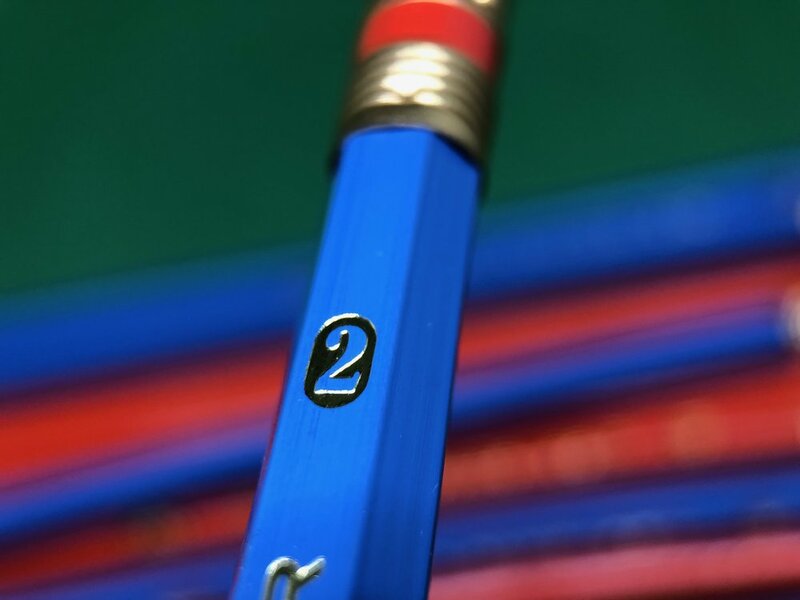 How can a pencil be smooth and scratchy? Lately I've been doing a lot of writing with my headphones on and when I can't hear the feedback, the pencil feels smooth. Headphones out, I hear the scratchiness. It also depends on the paper. Something with significant tooth will make it feel scratchy, but it feels pretty smooth on smooth paper, even standard Finch 60# in Field Notes. I often mention here that I find HBs a bit too hard for that smooth paper, but definitely not these. 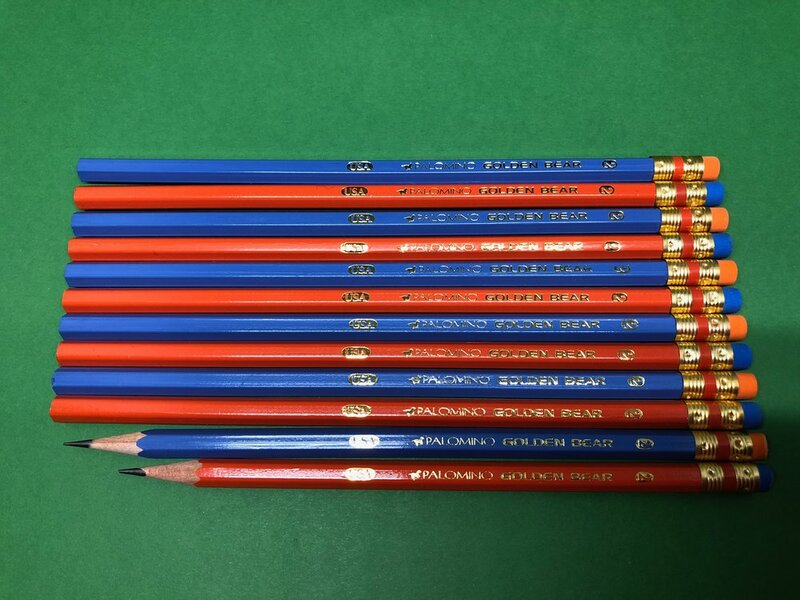 These pencils, as I mentioned above, are made by Musgrave, and when they're your manufacturer, you're in for quite the trip. But in all honesty, they've done a good job here. The erasers are still a hard, gritty, smeary mess, but everything else is pretty decent. 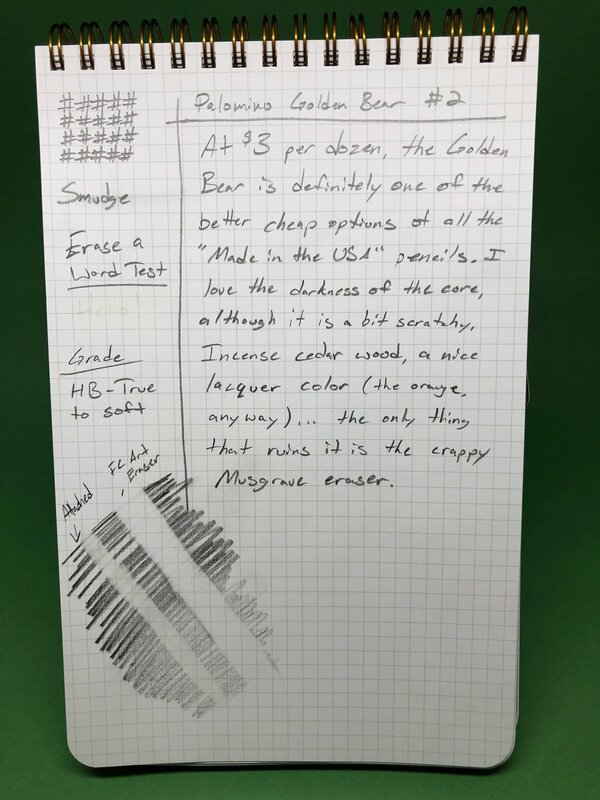 I've always heard that the reason for this pencil is to prove that quality cedar pencils can still be made in the USA, but I'm also under the suspicion that the cores are made elsewhere and sent to Musgrave, along with quality cedar slats, to have the pencil assembled here so they can say Made In the USA. Again, no matter. For $3 a dozen, they can be made on the moon for all I care, they're that good. Available from Pencils.com, $2.95 for a box of 12.